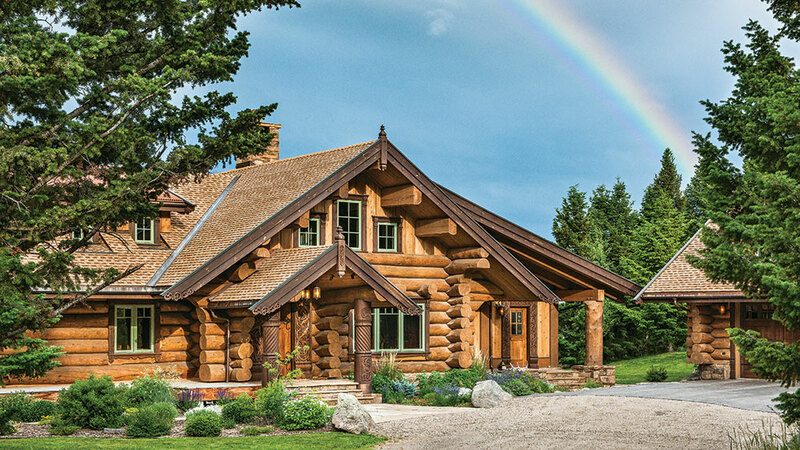 Built with 15 wood species and designed with color and light, this Norwegian-inspired log home is reminiscent of a forest teeming with life. 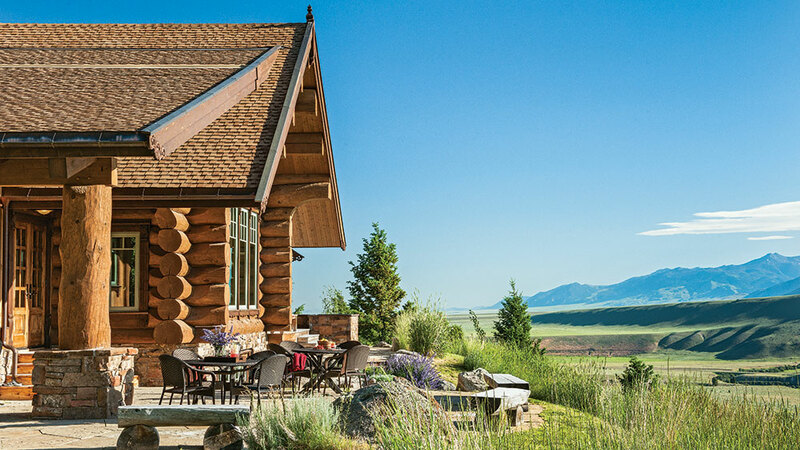 Perched on a ledge overlooking the Madison River in Montana’s Upper Madison Valley, Jarl and Molly’s log home is a marriage of Old and New World traditions and innovations that mirrors their own trans-Atlantic union. And it brings out the best of both. Jarl and Molly were intentional in their aim to build a home while their children were young. They wanted it to be the place in which they’d grow up and thus “come home to” later in life, rather than simply visiting mom and dad. With the same intuitive luck he had in finding Molly, Jarl stumbled upon Blair Anderson of Hilgard Log Builders. “I was impressed with his full-scribe, non-chinking style. That’s very Norwegian,” says Jarl. Blair believes the best homes are built when homeowners are involved, and “Jarl was on fire during the project,” declares Blair. The almost-daily communication made their long distance collaboration a success. Working with interior designer Elizabeth Schultz of Bozeman and architect, Brian Brothers, the team thrived on each other’s creativity and input. “He knew what he wanted and had excellent ideas,” says Elizabeth, “It was our job to connect the dots for him.” At the core of Jarl’s vision was a home designed as if it were built by a Norwegian immigrant in the New World. The three-level, five-bedroom, log home evolved from there. As is his trademark, Blair traveled far and wide to hand-select the trees to be harvested for Jarl and Molly’s home. Once the general scope of the project was determined, Blair chose 130 trees. “It’s like picking a canvas,” says Blair, an artist of logs. Hilgard Log Builders uses winter-harvested trees (when sap production is down) then dries them in the log yard with the bark on for at least a year before construction begins. Blair and his crew use a shrink-to-fit joinery method that takes into account the gradual settling of the log walls, which can take up to five years. 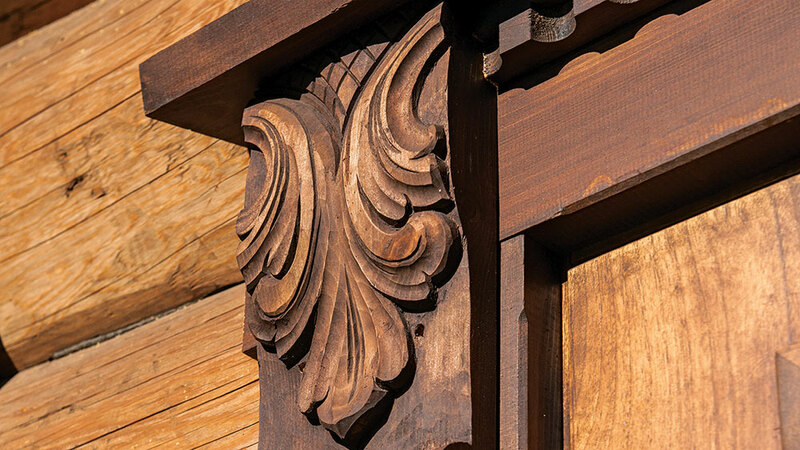 The ornately carved front door portals and entry posts greet visitors with classic Norwegian style, but the inside is where the old and new worlds really merge. 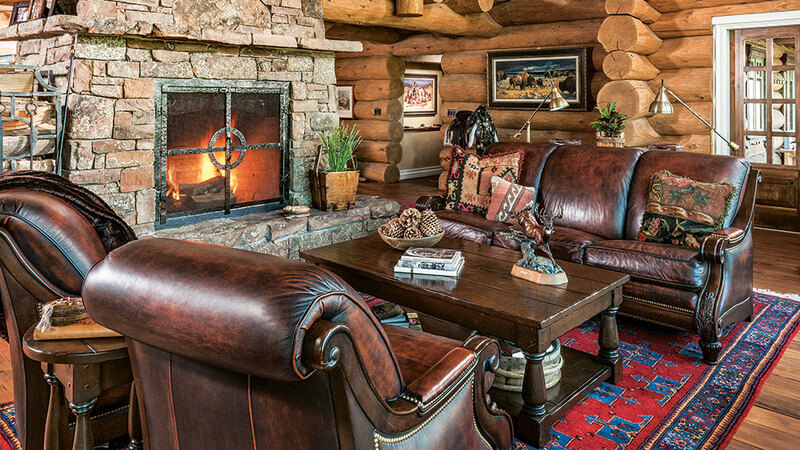 “Logs steal light,” Jarl admits, “which is why Norwegians use wide window trim and deep sills painted white to pull light into the room.” In addition to the sills, white tongue-and-groove ceilings contrast with the warm log beams and do their part to reflect light around the space. Elizabeth took this Norwegian custom one step further by painting the interior board-and-batten gable ends white throughout the house. In the second-floor master bedroom, natural light pours in from three sides of the room, reflecting off the white wood walls and plaster ceiling. The effect is airy and inviting, almost contemporary. 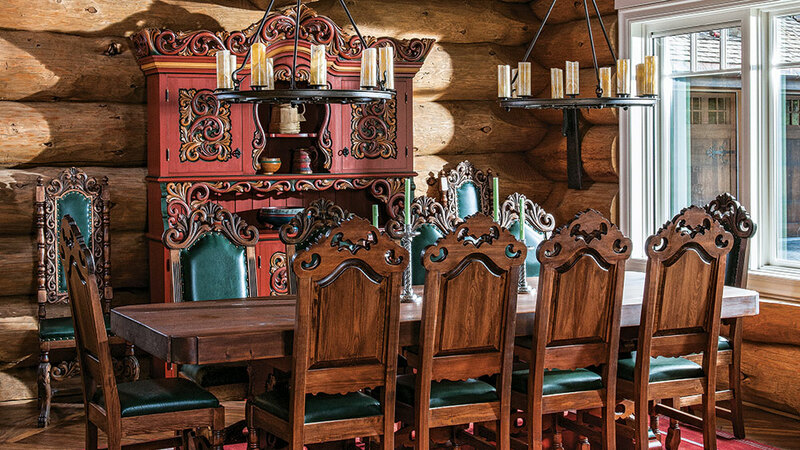 At Jarl’s insistence, the Hilgard crew used a relatively dark stain on the interior logs and abandoned the usual protective wax or oil finish to emulate a naturally aged look. 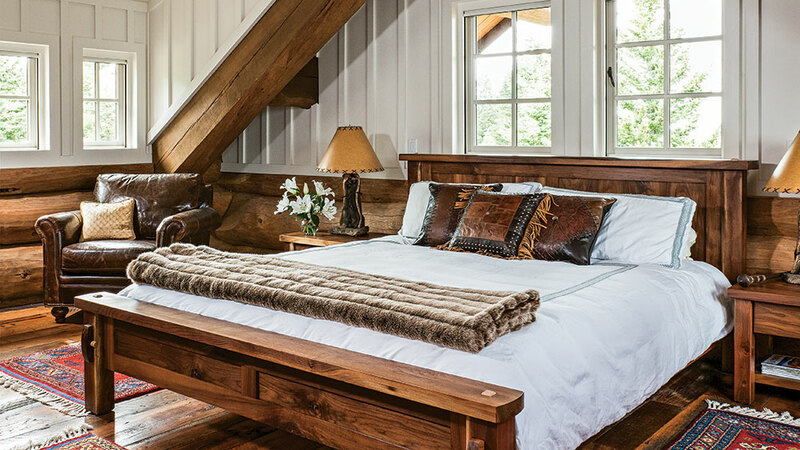 The bunkrooms are a nod to Jarl’s childhood growing up in a 500-square-foot cabin in the Norwegian mountainside. “We kids, the cousins and siblings, wanted to be together at night,” he explains. The bedrooms may seem small by American standards, but there are plenty of spacious common areas for gathering and private nooks for retreating. “It seems a waste of space to make sleeping rooms large,” notes Jarl. The “Green Bunk Room” sleeps six and features built-in drawers, shelves, a hutch and a host of climbing opportunities. The “Red Bunk Room” sleeps two and offers a stunning view of the Madison Range. “We’re not shy when it comes to color,” Jarl jokes of his countrymen. The Norwegian-inspired palette runs the gamut of rich vibrant hues, crisp whites, and warm tones that highlight the 15 different species of wood utilized throughout the home. Besides Douglas fir log walls and standing-dead western larch roof timbers, the doors are made of butternut (an eastern Canadian hardwood). Poplar was used for most of the trim, reclaimed walnut for the main level floors and reclaimed oak for the second level and basement floors. Jarl and Molly’s home is a forest full of life. The kitchen, great room and dining room, while divided, aren’t cut off from each other. A central stone fireplace tapers up and in from all directions providing the centerpiece around which the other areas radiate. 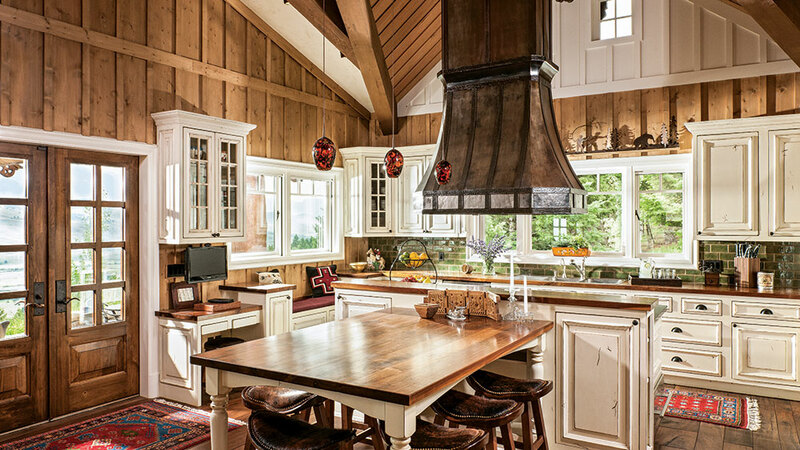 Built to resemble a timber-framed addition, the kitchen is a natural gathering place open to other rooms as well as to the outdoors. Growing up in the Rocky Mountains, it was important for Molly to establish flow between the interior and nature. Decks and patios encircle the perimeter. The small lawn and simple gardens merge into native grasses, keeping the focus on the surroundings. 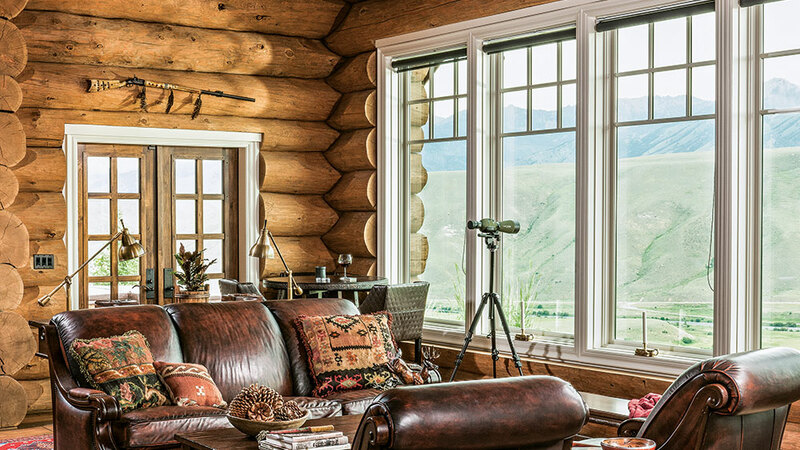 Standing on the landing inside Jarl and Molly’s log home, the great room windows frame a view of 11,316-foot Hilgard Peak, the tallest and most iconic mountain in the Madison Range. It’s only fitting that Hilgard Log Builders erected the log work around it. “I think we nailed it.” Jarl remarks with a satisfied smile. 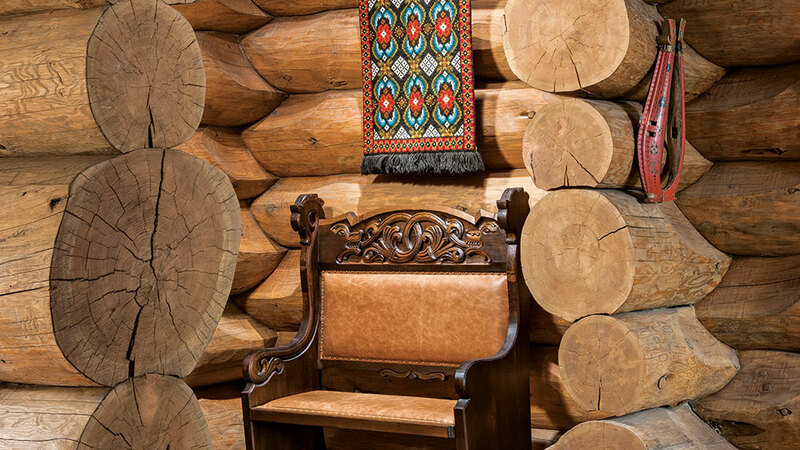 Unlike most modern American houses, Jarl and Molly’s log home isn’t exactly open concept. Each room is clearly defined, but they aren’t cut off with walls. The tapered stone fireplace serves as a center point (and a room divider) between the great room, dining room and kitchen. You’ll find nooks and alcoves incorporated into the design throughout the home, like this one off the entryway. A casual seating area, complete with overstuffed leather furnishings and a spectacular view, afford easy conversation. Creamy cabinets and white board-and-batten do their part to brighten the kitchen, designed to look like a timber-framed addition. Even where there are no log walls, you’ll find a healthy dose of wood. Jarl and Molly envisioned their home to look like it had been built and furnished by a Norwegian immigrant. “We’re not shy when it comes to color,” Jarl jokes of his countrymen. Jarl’s office is simple and comfortable. 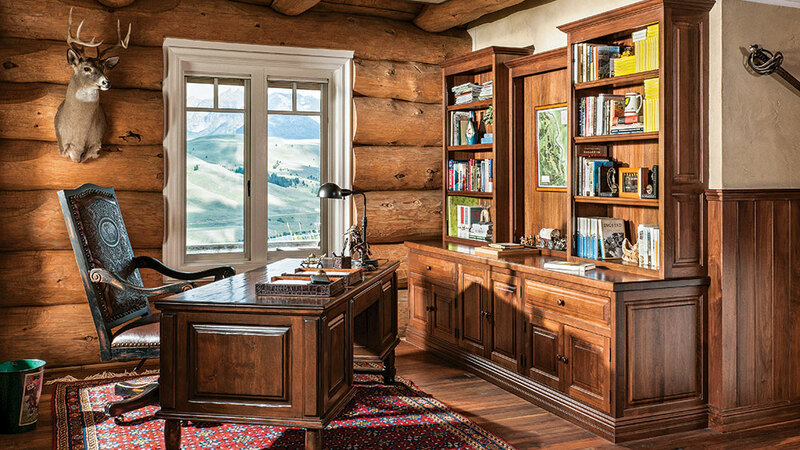 A ornately carved leather desk chair plays off the clean lines of the desk and built-in bookcases. Three courses of logs topped with bright white board-and-batten create an open, airy effect in the master bedroom that feels almost contemporary. The continuity between rooms is an element that makes this home work as a whole. 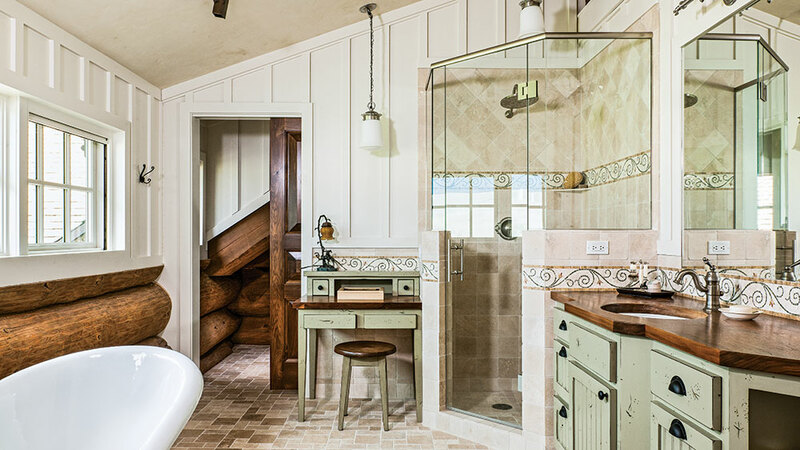 The master bath’s palette of whites, creams, soft greens and rich wood tones creates a bright but tranquil space to get ready for the day. 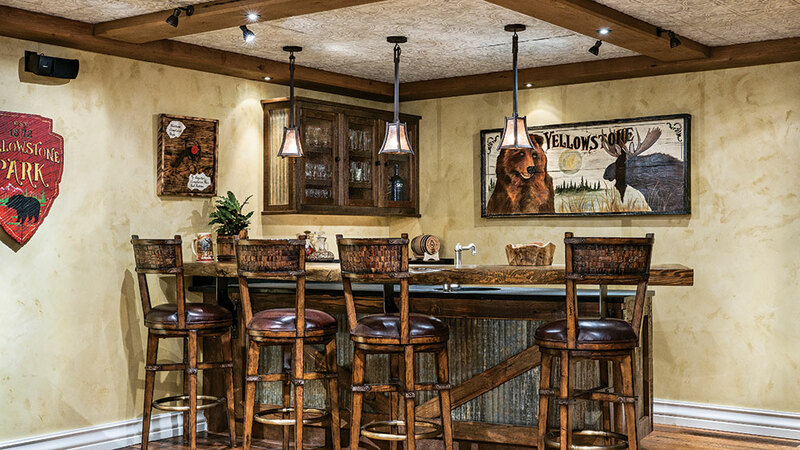 This home may look like it’s nestled in the mountains of Norway, but the cozy bar reminds guests that they’re firmly planted near Yellowstone National Park. From their cozy patio, surrounded by native plants and grasses, Jarl and Molly enjoy an expansive, uninterrupted view of the majestic 11,316-foot-high Hilgard Peak, the tallest and most iconic mountain in the Madison Range. 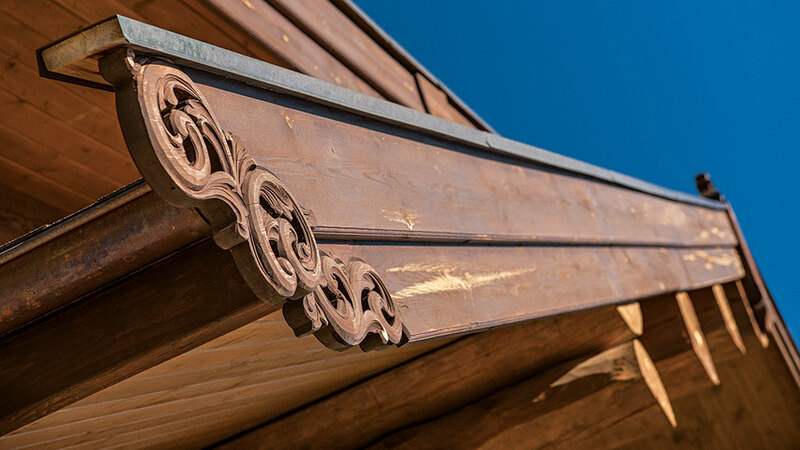 Three brothers — woodcarvers from the Norwegian municipality of Oppdal — crafted the window trim, fascia, entry portals and many of the home’s other details. “When I opened those containers, that’s when I fully appreciated the detail of the project,” says Hilgard’s Blair Anderson.